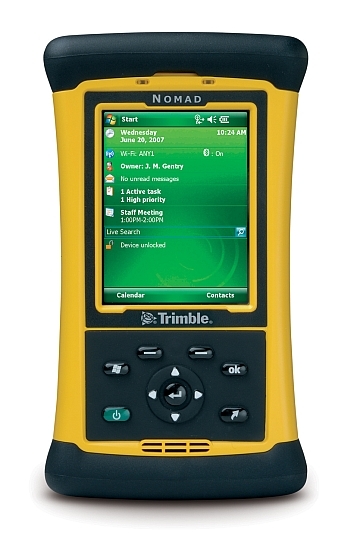 The Trimble® Nomad® 900 series packs even more functionality into one of the most powerful and full-featured rugged handheld computers available. Standard features include an 806 MHz processor, a long-life lithium-ion battery, 512 MB to 2 GB of Flash storage and integrated wireless capabilities like GPS, Wi-Fi and Bluetooth®1. The high-resolution, sunlight-visible VGA display shows images, maps and data in crisp detail. Optional features include an integrated cellular WWAN, laser bar code scanner and a 5 MP color digital camera. The Nomad computer also includes the latest Windows Mobile® 6.1 software, so it runs all the applications you use most, including a wide range of third-party software for industry specific applications. The Nomad computer's many builtin capabilities make it easy to collect, save and transmit data in the field. The integrated SiRFstarIII GPS receiver with SiRFInstantFixII technology enables position acquisition in less time and in challenging environments such as in canyons, under heavy canopy and even inside buildings2. Now navigation is faster, more accurate, more reliable and more consistently available. All models come with a Secure Digital (SD/ SDHC) slot. Depending on the model, even more capabilities can be added via a CompactFlash (CF Type II) slot. Like other Trimble rugged handhelds, the Nomad computer meets rigorous MIL-STD- 810F military standards for impact, vibration, humidity, altitude and extreme temperatures. It also comes with an IP67 rating. That means the Nomad handheld is completely sealed against dust, and it can survive immersion in up to a meter of water for 30 minutes. Trimble rugged handhelds have proven their reliability and lower Total Cost of Ownership (TCO) over consumer grade handhelds3 in the field with thousands of real world users. The Marvell 806 MHz processor, when combined with Trimble’s optimised graphics processing, advanced caching, and proprietary high-speed journaling file system, makes the next generation Trimble Nomad series one of the fastest Windows Mobile handheld computers on the market today. Tuned to maximise the integrated GPS receiver’s performance, the next generation Nomad also has an improved antenna design which significantly improves Time-to-First-Fix (TTFF) and fix under thick canopy. 1 Nomad 900B models have Bluetooth only. 2 Tracking ability and position accuracy will vary depending on building construction. 4 To ensure best performance when temperatures are below –4 °F (–20 °C), be sure battery is inserted in the device only when in use. When device is not in use at these temperatures, keep batteries in a pocket or stored in a warmer area.